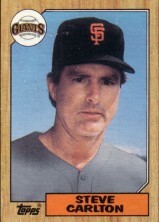 Mini 1987 Topps card #B of Hall of Fame pitcher Steve Carlton distributed only on the side panel of certain wax boxes. ExMt or better due to surface marks. ONLY ONE AVAILABLE FOR SALE.